Common to abundant, permanent resident throughout the state (Grinnell et al. 1937). Occurs in almost all habitats and successional stages to elevations as high as 3000 m (9840 ft. and also in large cities such as Los Angeles (Bekoff 1999). Frequents open brush, scrub, shrub, and herbaceous habitats, and may be associated opportunistically with croplands. Also found in younger stands of deciduous and conifer forest and woodland with low to intermediate canopy, and shrub and grass understory. Feeding: An omnivorous opportunist. Eats primarily mice, rats, ground squirrels, gophers, lagomorphs, and carrion (Ferrel et al. 1953, Bekoff 1977). Takes some insects, reptiles, amphibians, fruits, and occasionally birds, their eggs, and deer fawns. Locally, some may take sheep and domestic fowl. Searches and pounces, stalks and chases, and may dig out prey. Hunts either solitarily, in pairs, or in small packs (family groups). Favors open habitats where it can chase down prey. Cover: Brushy stands of vegetation, natural cavities, and suitable soil for the excavation of dens provide cover. Reproduction: Will use natural cavities in rocky areas, hollow trees and logs, caves and holes. Also will dig dens, usually on brushy, south-facing slopes. Pattern: Suitable habitat is characterized by interspersions of brush and open areas, with free water. Activity Patterns: Active yearlong. Mostly crepuscular and nocturnal, occasionally diurnal. Seasonal Movements/Migration: Non-migratory. Movements vary with season. Often follows roads, trails fence lines, paths. Home Range: Bekoff (1977) reported home ranges of 8-80 km² (3-31 mi²). Home ranges of males overlapped considerably, but those of females did not. In Sierra County, home ranges varied from 10-100 km² (4-39 mi²) (Hawthorne 1971). Movements varied according to season. Territory: Territoriality not substantiated (Bekoff 1977). Reproduction: In California, mates from January to March. Gestation is about 63 days. Most young are born from March through May. One litter/yr of 5-6 average, ranging from 1-11, or more (Bekoff 1977). Young weaned at 5-7 wk, and leave parents at 6-9 mo (Bekoff 1977). Most males and females breed first in second yr. Pairs tend to remain together for yrs. Niche: Coyotes are adaptable predators, found in most open habitats. They are tolerant of human activities, and adapt and adjust rapidly to perturbations and changes in their environment. Widespread efforts to control or reduce coyote numbers largely are unsuccessful (Connolly and Longhurst 1975, Bekoff 1977, 1978). They remain common to abundant throughout much of the state. 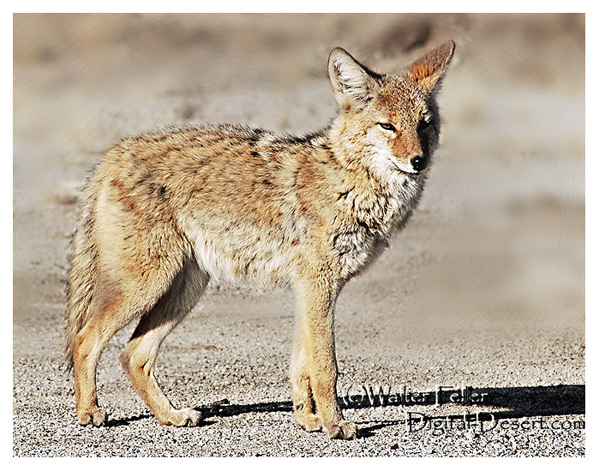 Golden eagles, great horned owls, and mountain lions occasionally may kill coyotes. Coyotes host various ectoparasites and endoparasites, and occasionally may carry rabies. The desert's most successful opportunist is the coyote. Its skill as a hunter for anything that can be swallowed ensures this omnivore's survival. The coyote's diet may include insects, lizards, snakes, birds, rodents, rabbits, carrion, fruit, nuts, grass, or tortises along with just about anything else that can be chewed or torn. Coyotes are famous for their howling but also bark when excited. They hold their tail between their legs while running, and can reach speeds of 40 mph.